Heroes Con takes place in Charlotte, NC, usually on Father's Day weekendat the Charlotte Convention Center downtown, but this year it was pushed to the end of June (June 30, 2006 to July 2, 2006). 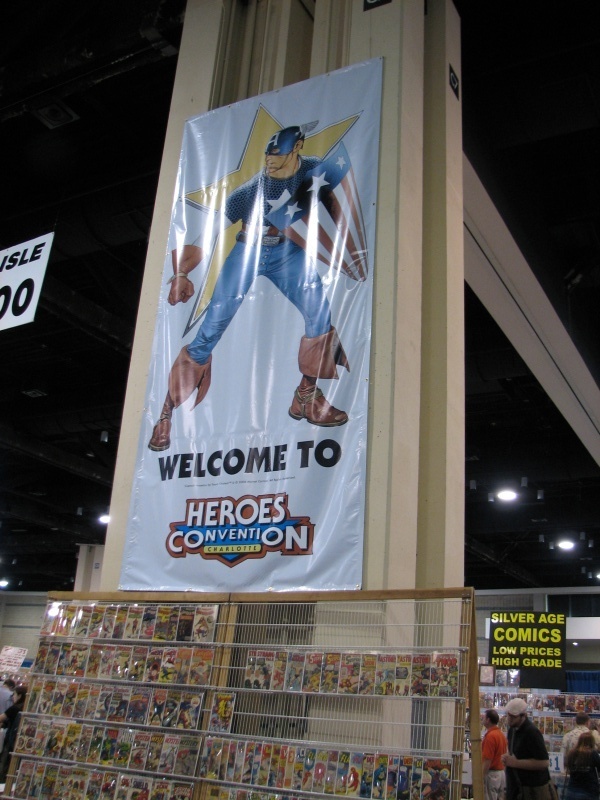 Heroes Con is a nice friendly place to take the whole family to enjoy comics, card games, Heroes Clix, etc. This year I made an effort to take more photos, and so I did. This year's photo album has over 600 photos. The photos are either 600x800 (portrait) or 800x600 (landscape) in resolution, but the original photos are 2592x1944 in resolution and might show up on Flickr, link to come later). In an attempt to not use my flash all the time, I took a lot of photos in auto mode (no-flash), which created photos with some blur in them, but I tried to only put the better looking photos in the photo album (but it seems I was not all that discriminating judging by the number of photos this year...). This year I am using the Canon S2 IS digital camera. Also, the art auction photos vary in quality due to lighting conditions, and many show the scary red eyes of Gus Vazquez when subjected to the flash of the camera (butI did try to reduce the red-eye in most photos). If you are into meeting some of the comic greats from the golden and silver age of comics, you'll always be surprised by who shows up at Heroes from year to year. 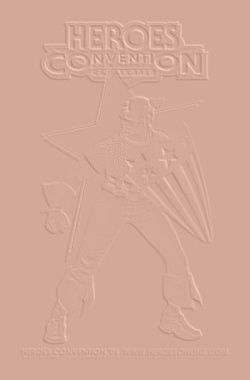 Given last year's Wizard World Atlanta bruhaha, scores of writers and artists, and editors and higher-ups rallied to Shelton Drum's side (Civil War, indeed). This year's guest list was packed with current creators, and respected former creators too. On Friday, we got a late start, so we didn't get into Charlotte around 2 p.m. on Friday, which meant missing a few interesting hours, but there was plenty to do over the course of the 3 days. Took in a Warren Ellis panel moderated by Heidi MacDonald, and then bopped around to see a nice lineup of guests signing stacks of comics, books, posters, etc. for their fans. One of the improvements for this year was the use of the 200-level of the convention center upstairs to hosts the 4 signing areas which had plenty of room for the fans and the guests, plus a ballroom and a few other rooms were utilized for panels that offered a nice array of topics that concerned comics today. The capper of Friday night was the After Hours with Warren Ellis at the Hilton. I had no idea I was in for over 3 hours of subjecting myself to a glimpse inside Warren's scary but intriguing mind. He was very entertaining and interesting, and pretty much nothing asked of him phased him one iota. Saturday came soon enough, and it's aways the busiest day of the convention (though Friday seemed to be a better day for the dealers as the Saturday crowd makes it harder to shop at the booths). I checked out bits of the DC 52 panel, and then a bit of the Silver Age panel. Then peeked into the Marvel panel (mainly about Civil War, which seems to be more than it should be, as I can't see why any of the costumed heroes would be on Iron Man's side of the issue, but I digress...). Having 2 panels of interest at the same time was a problem for me once again during the Terry Moore panel and the Warren Ellis/Bryan Hitch panel, but I able to get a flavor of both, but wish I could have been in 2 places at one time for a few of these panels this weekend. 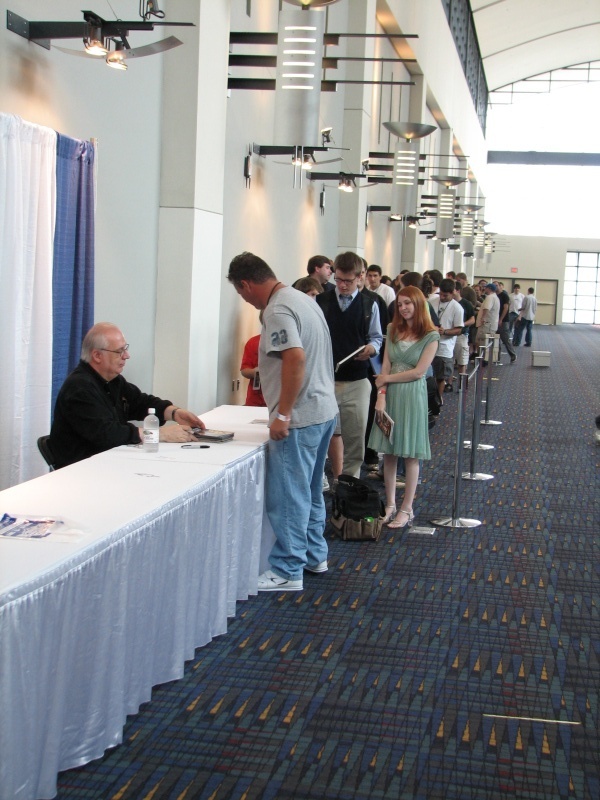 Also snapped some funny shots of people in line for autographs. I also spent most of Saturday checking the progress of the art pieces that a few of the artists were creating for the annual art auction later that evening in a Westin ballroom, which literally occupied most of Saturday night because it went on for about 4 hours, and then the line to pay via credit card took another half hour (my friend won the very last item up for bids, thus the extra wait, but it was good because I got to hang around and snap some shots of Rosario Dawson with one of the winners of a piece of artwork featuring her Sin City character, Gail, along with the artist of the piece). Sunday was a little less busy, but there were still a few panels of interest. In the morning I checked out a panel dealing with getting comic-related TPBs into the library systems (natural expansion of comicsfrom the direct market and the bookseller market), and also peeked inside the Dan Didio talk about the upcoming DC projects and titles (interviewed by Matt Brady), and it sounds like some of the One Year Later titles feels like DC's attempt to throw spaghetti on the wall and see which titles stick (and resonate with the fans). Also checked out a small portion of the Los Bros Hernandez panel (how did Shelton get them to come to North Carolina?). The best panel of the show for me was the one featuring some really top artists working in comics today (Andrew Robinson, Adam Hughes, Tim Sale, Bryan Hitch, and Travis Charest, panel moderated by Mark Chiarello, DC Art Director). Pretty much all the artists are in awe of Travis Charest's artistic abilities. The last panel I attended was the Greg Rucka panel (with Matt Brady moderating). In between the panels, I also filled quite a few holes in my comics want list during Sunday shopping downstairs in the dealer's room. The evening was capped off by seeing Superman Returns at the AMC Pavillion 22. Feel free to email me for corrections on guest identifications, etc.